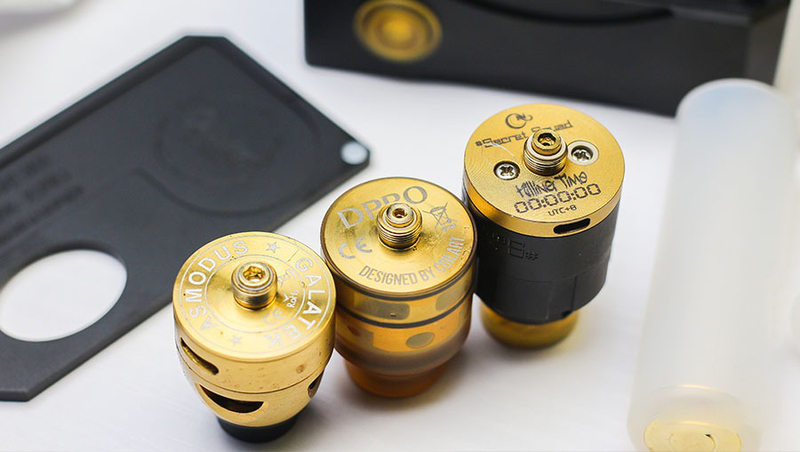 CoilART In the previous product DPRO RDA kit, equipped with a bottom of the oil electrode screw, which is not only out of the atomizer “compatibility” considerations but also for the Master follow-up products foreshadowed. 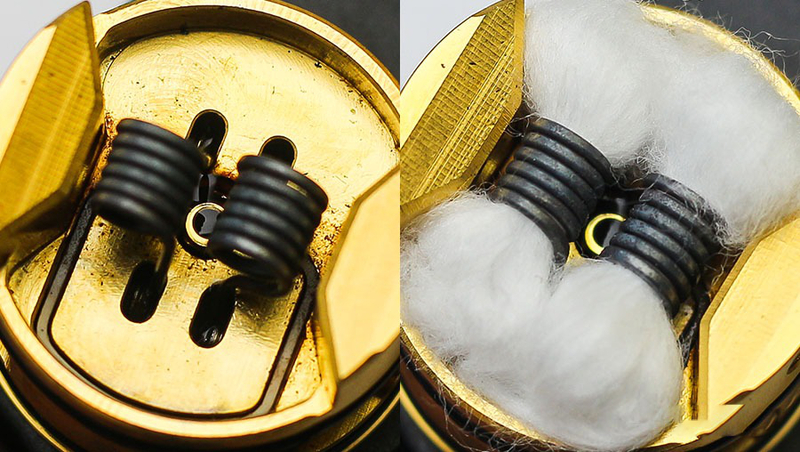 CoilART’s product line has always been mainly atomizer, also produced “Tricker” series of host and mechanical rod. Recently, the Master once again released a new host device – AZEROTH Azeroth “pinch music,” not only with the bottom of the oil supply structure, but also support 21700,20700 and 18650 batteries. Comes with two new hotspots buff add Azeroth what is the experience? 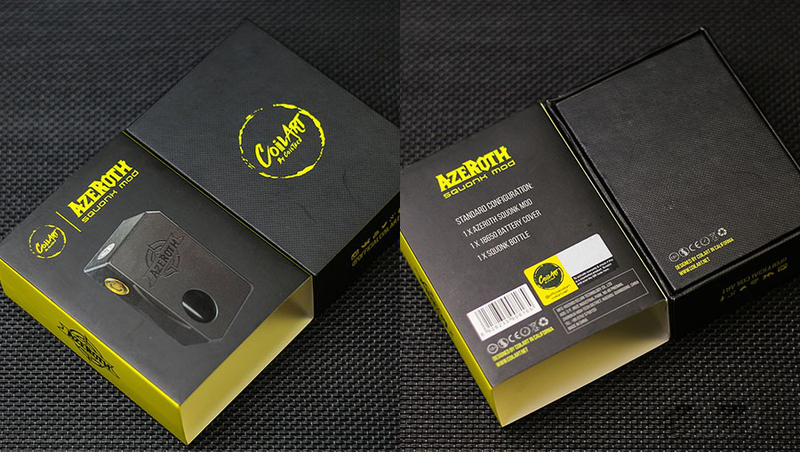 Share CoilART Azeroth Box Mod today. CoilART Azeroth Box Mod is currently available separately in the form of a host, that is, if you want to experience the bottom of the oil, the hands of DPRO RDA or other support at the end of the atomizer, or TA is only a support for the new battery “Single mechanical machine host”. 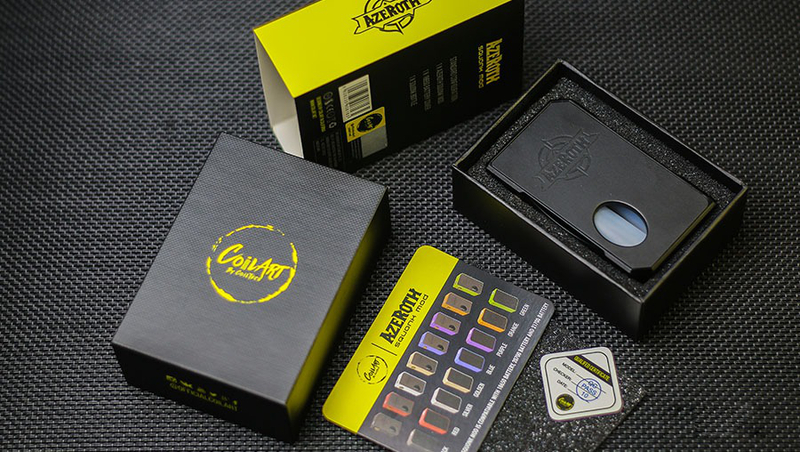 Wrapped with CoilART traditional carton + cover, the overall black and yellow color, simple and striking. Packaging contains AZEROTH a host, a certificate and a card; the host is the current eight kinds of the color scheme. 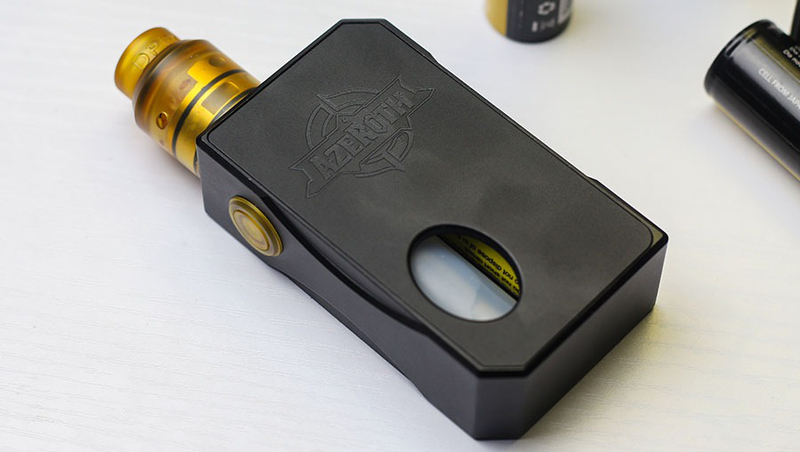 CoilART Azeroth Box Mod host rectangular, two diagonal design for the slope, the host size is 85.5mm x 50mm x 27mm, with an ordinary dual power host quite. The host as a whole made of aluminum material, anodized paint treatment process. One side of the cover engraved with the AZEROTH LOGO, the lower left corner with oval-shaped openings, you can squeeze through the internal oil tank for the atomizer oil supply, cover removable. 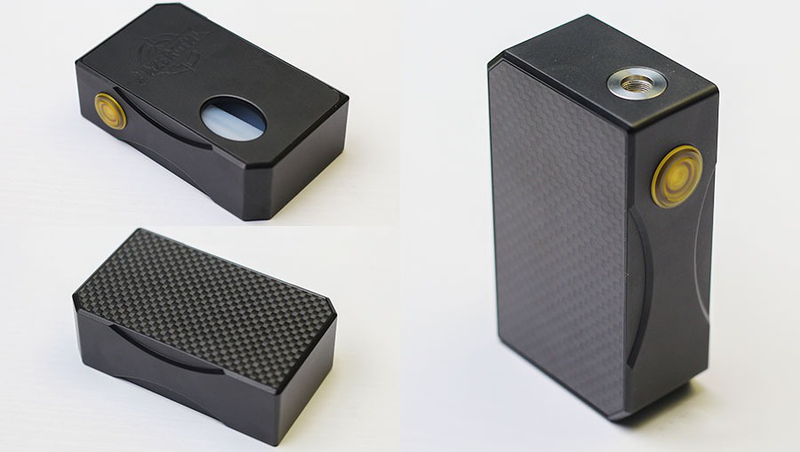 The other side of the host using a carbon fiber material, not removable. Between the cover and the host through the two pairs of magnets fixed, through the card slot to prevent loose, cover the back with LOGO and engraving. Oil storage bottles and battery conversion sets are used food-grade silicone material, very soft, feel comfortable. 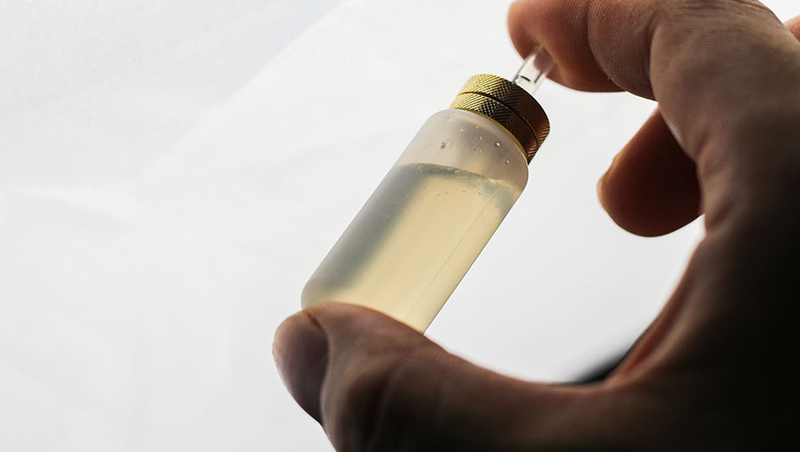 The oil storage bottle consists of the container, the cap, and the tubing, and the cap can be removed entirely to facilitate the daily cleaning of the oil storage bottle. 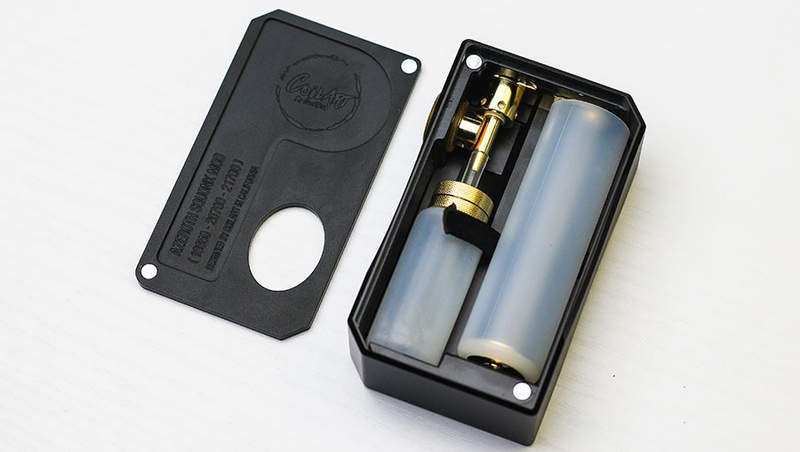 CoilART Azeroth Box Mod as a mechanical host, the circuit design is also more interesting, straightforward. 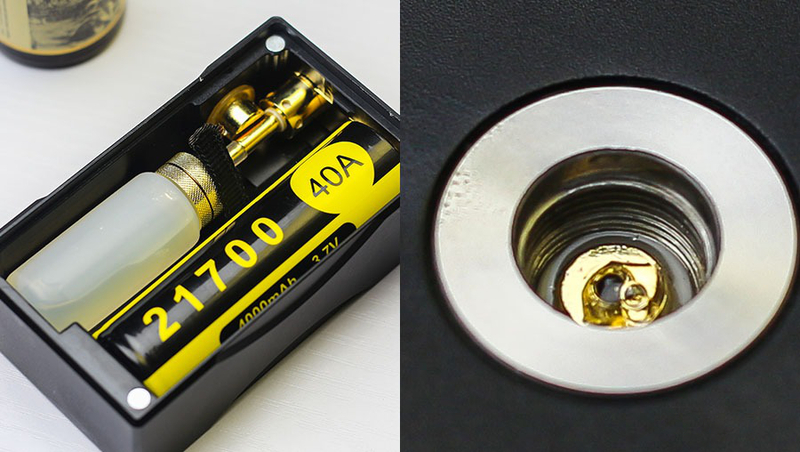 After the battery is installed, the negative pole of the battery is connected directly to the negative terminal of the 510 interface through the metal plate. The lower pole is connected to the power switch. After the user presses the switch, it contacts the positive part of the 510 and turns on the circuit. The oil storage bottle is made of oil-grade silicone material, very soft, very convenient in squeezing the oil supply and daily cleaning. If the user wants to replace the different flavors of oil after use, you can rinse with water, and then twist the paper towel into the bottle after squeezing the bottle, with a paper towel to dry the residual moisture. 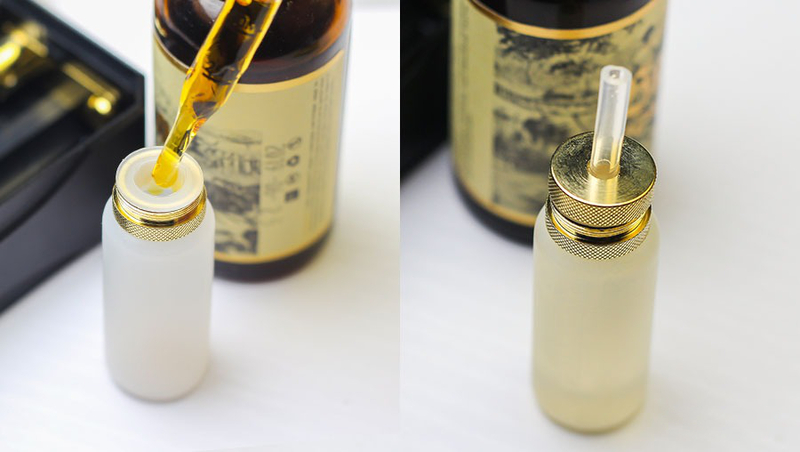 Although the volume of the oil storage bottle reached 7ml, I do not recommend the excessive addition of smoke oil or will be installed in the oil cap when the pressure and the impact of the size of the tubing caused by leakage, so do not add too much smoke, it is good. 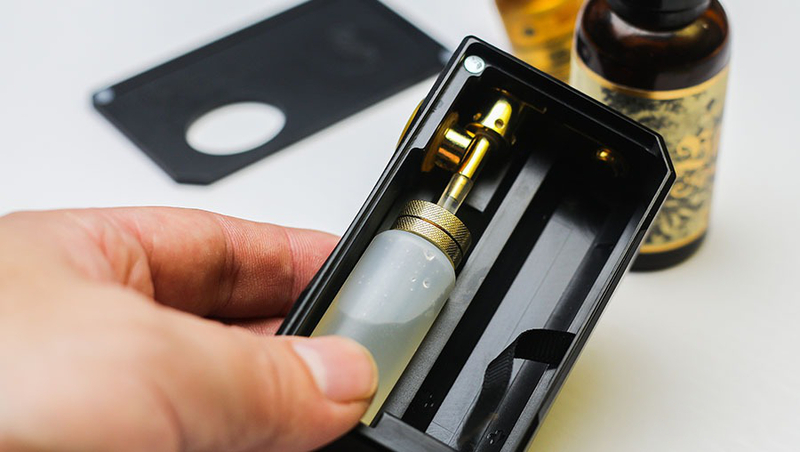 After filling the oil in the oil bottle, adjust the position of the tubing, the end of the bottom of the oil bottle, and then the other end and 510 interface connection, then the oil bottle into the host internal. 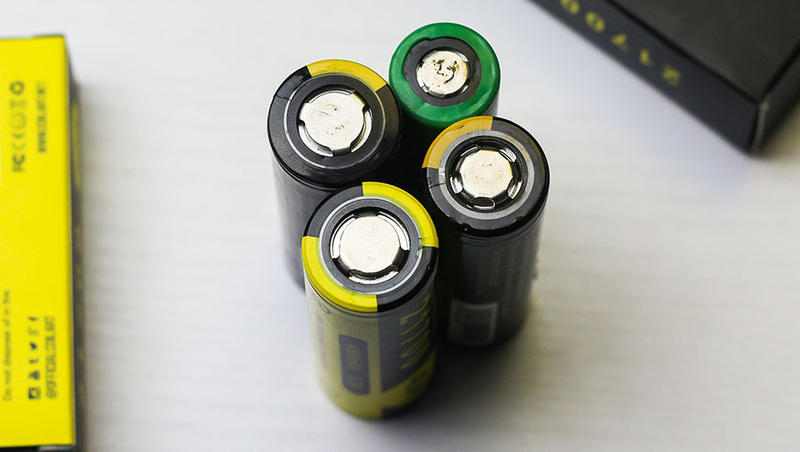 AZEROTH not only supports the latest 21700 battery but also supports 20700 and commonly used 18650 battery, the application of new models of cells, make up for the “single power” in the life and output deficiencies. 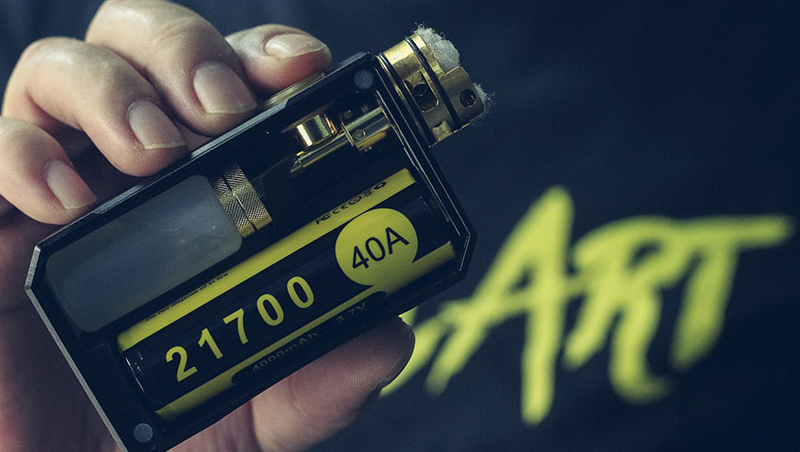 CoilART this time not only released the AZEROTH pinch music host but also freed a 21700 battery capacity of 4000mAh, almost close to 2 SONY C4 battery capacity, the output current to support 40A discharge. Although the 21700 ratios of 20700 in the model on the diameter of more than 1mm, but the actual comparison, the former or to appear a lot of the exact measurement of the width of almost reached 22mm. 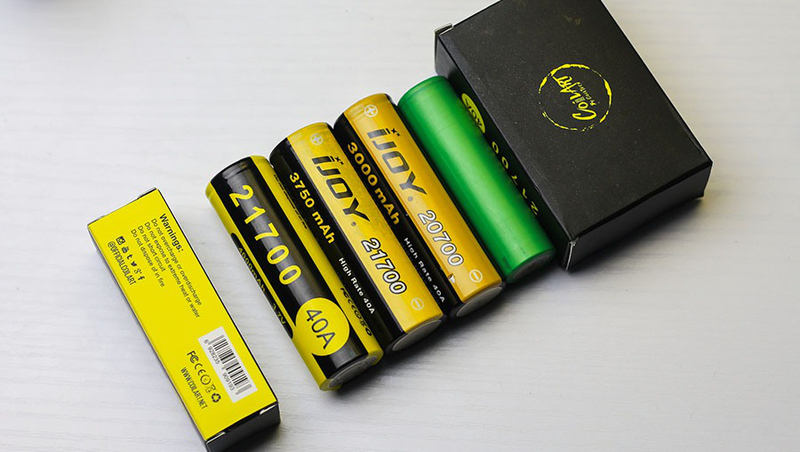 In the battery selection, 20 and 21700 battery length, just different diameter, so you can go directly to the host to use, if you use the 18650 battery, you need to use the conversion sleeve. 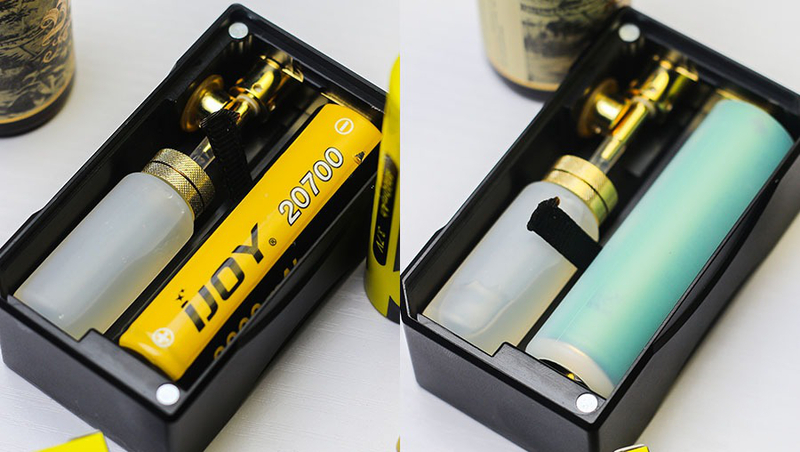 The principle of oil supply is also straightforward, squeeze the oil storage bottle, smoke oil will be pressed into the tubing, through the hollow 510 interface to the atomizer. 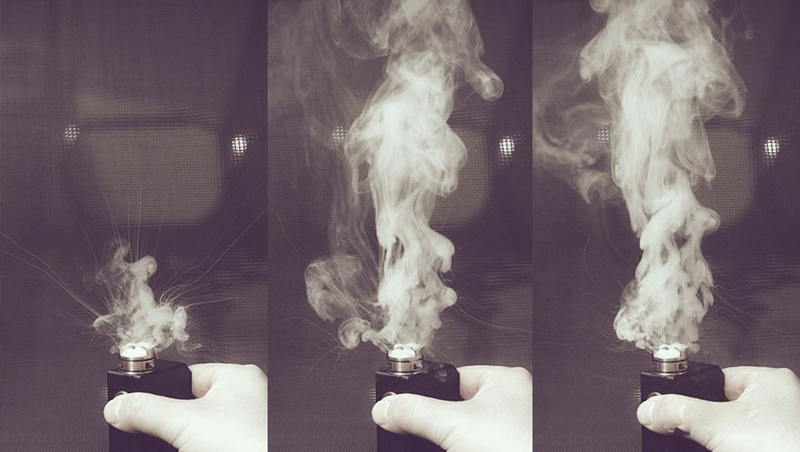 Users in the daily use, feel the smoke becomes smaller, the taste fades, on behalf of the atomizer need to refuel. 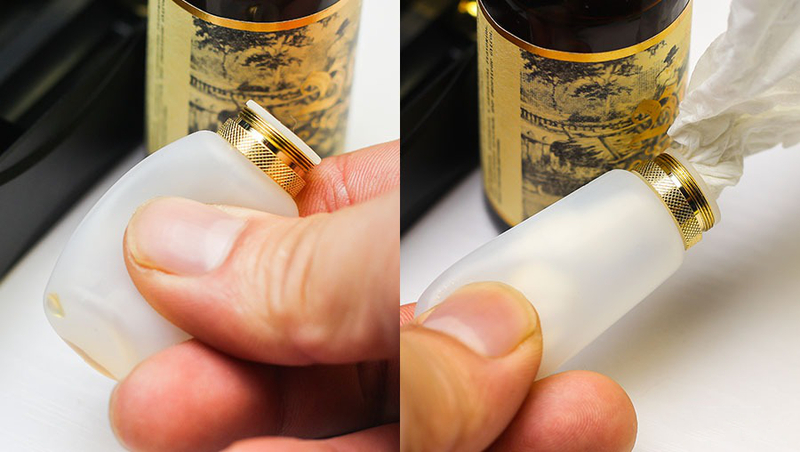 Squeeze the oil pan slowly into the atomizer by the cotton absorption, loosen the oil bottle when the remaining smoke in the warehouse is sucked back, so do not have to open the lid to refuel. 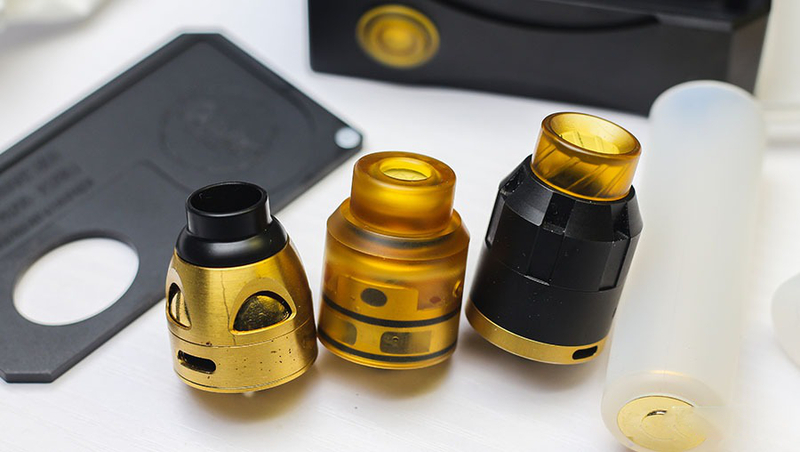 But this does not mean that users can arbitrarily squeeze if the frequency is too high, the pressure is also significant, into the atomizer too much smoke, into the pores will cause oil spills. So just use pinch music, to be familiar with the pressure of the frequency and intensity to grasp the correct timing and quantity of oil to avoid oil spills. 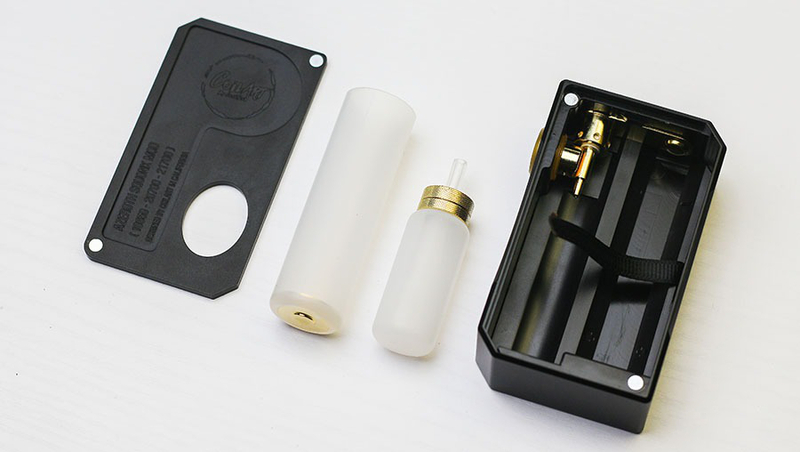 in support of the nebulizer, AZEROTH can support the standard bottom of the oil atomizer, regardless of whether the middle hole diameter has been used in the AZEROTH host can be used, in addition to their home DPRO RDA, the current more popular At the time of the killing, Galatea’s RDA with the bottom of the oil supply electrode can also be entirely compatible. AZEROTH is a real machine host, more suitable for output with a stronger, more substantial capacity 21700 battery, explosive power, output performance and endurance have been significantly improved, especially concerning standby capacity, you can experience a significant increase. 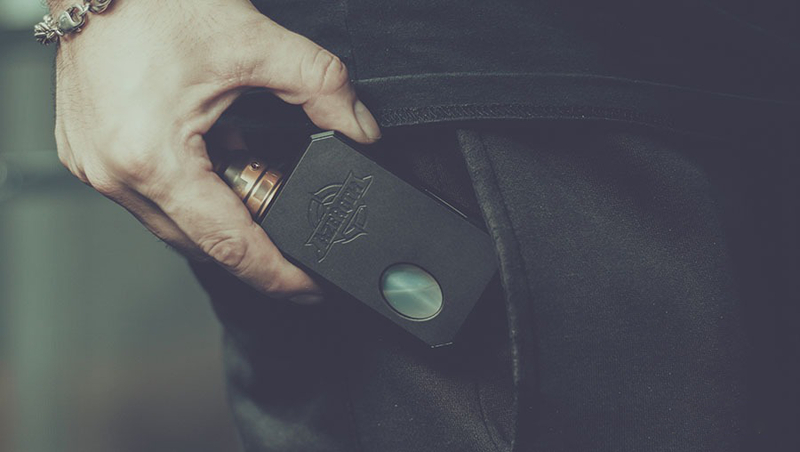 At present, the vast majority of the Squonk structure of the host, the pursuit of both small size, modeling sophistication and portability, and CoilART Azeroth Box Mod from the output performance and endurance capacity to proceed to more significant role, more powerful output 21700 battery as a power supply Program, although the expense of the advantages of the volume, but in practicality has been dramatically improved, single power host capacity of the shortboard has been made up, do not have to replace the battery frequently. According to official sources, although the domestic price will be in the same type of battery has a particular price advantage, but for the average user, the threshold is still slightly higher, if AZEROTH can be compatible with 18650 battery, I think it will lose a lot Fun, affect the degree of experience. Also, note that AZEROTH is a real mechanical host, so try not to use it to dry the coil, to avoid the resistance is too low or spiral installed adequately damaged the battery, Strength, and frequency, to prevent this kind of pinch music host is not familiar with excessive fuel caused by leakage.